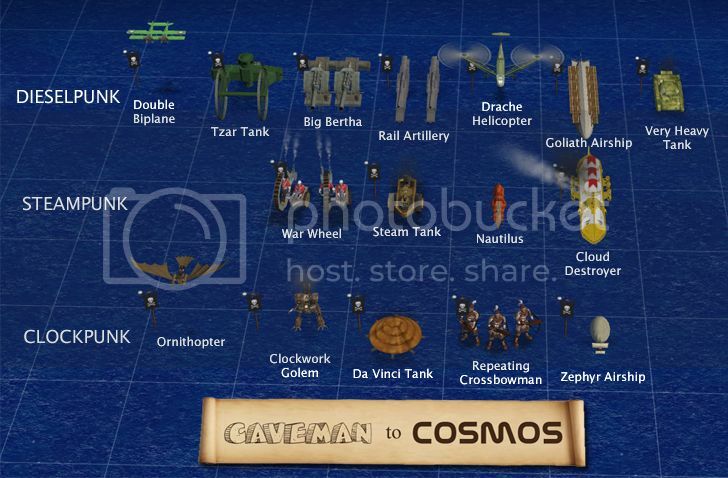 Discussion in 'Civ4 - Caveman 2 Cosmos' started by strategyonly, Aug 25, 2008. Compatible across versions. Continue playing your current game of C2C - just save our current game and load it in the new version. 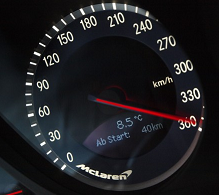 You will be asked "Should the modifiers be recalculated?". Just say yes, wait awhile and then continue your game with all the new features. 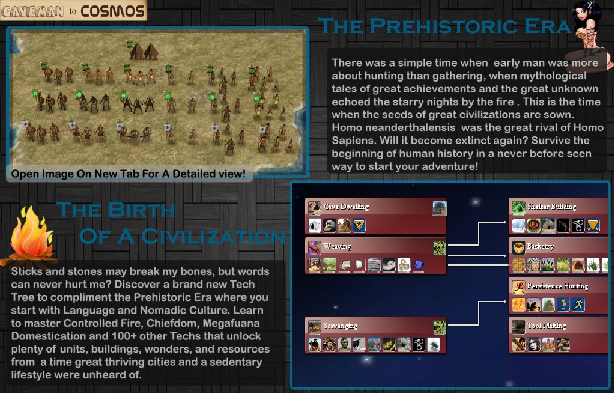 NEW tech tree including Space Era . . . .
And so begins 100,000 years of history..
Caveman2Cosmos is a CivFanatics.com community mod that add new features, gameplay, and content to the Civilization 4 experience. It is the most expansive Civilization 4: BTS mod to date with almost daily updates since November 2010. 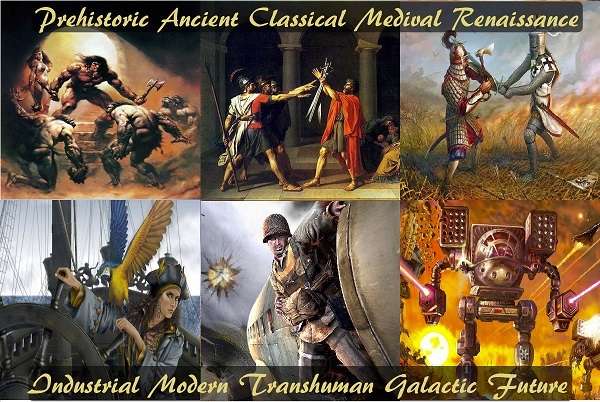 It is the spiritual successor the The Civilization 4 mod Rise of Mankind and its addon A New Dawn, and combines the work of over 100+ CivFanatics.com past and present modders to create a mod to "rule them all". 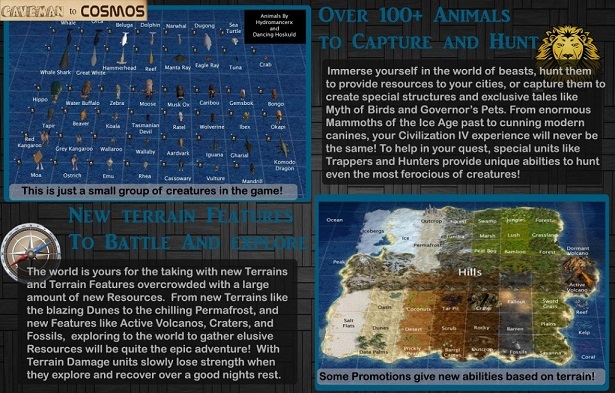 It is currently being developed by StrategyOnly Productions with a modding team made up of prominent members of CivFanatics.com. 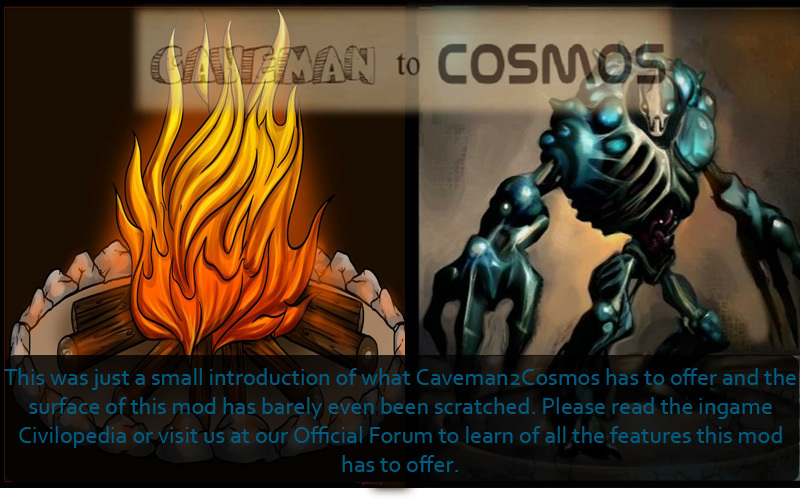 Caveman2Cosmos introduces a massive amount of new content with massive customization to Civilization 4 : Beyond the Sword. From the the discovery of controlled fire in the Prehistoric Era to the spaceships of the Galactic Era this community mod is perfect for the player who craves very deep strategy but is still enjoyable to the more casual player. Be warned, with this much content this mod may take almost 100 hours or more to win a single game. This mod is evolving on a weekly basis and new features are added all the time! We listen to all player ideas and suggestions, and our goal is to continue our tradition of making the best possible megamod for Civilization 4. We believe in the power of community and our forum is our own little civilization with hundreds of thousands of valuable posts from players all around the world. This mod is updated almost daily and we encourage the use of SVN to get the latest "pre-release". We would like to say thanks to all the players who have supported us over the years. Please read post # 6 before asking some questions, thx. raxo2222 and canexpthat like this. ANDEAN: A prominent theme in Inca mythology is the duality of the Cosmos. The realms were separated into the upper and lower realms. Hanan Paca, the upper world, consisted of the deities of the sun, moon, stars, rainbow, and lightning while Ukhu and Hurin Pacas were the realms of Pachamama, the earth mother, and the ancestors and heroes of the Inca. Cay Paca, the realm of the outer earth, where humans resided was viewed as a intermediary realm between Hanan Paca and Ukhu Paca. The realms were represented by the condor (upper world), puma (outer earth) and snake (inner earth). ASATRU: Asatru is a term used to describe the religious traditions which were common amongst the Germanic tribes living in Nordic countries prior to and during the Christianization of Northern Europe. Norse paganism is therefore a subset of Germanic paganism, which was practiced in the lands inhabited by the Germanic tribes across most of Northern and Central Europe in the Viking Age. Our knowledge of Norse paganism is mostly drawn from the results of archaeological field work, etymology and early written materials. 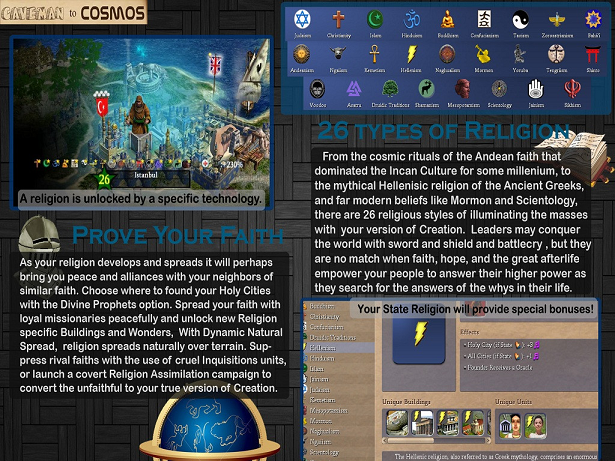 DRUID: Druidism doesn't work as usual religions does ,it has a big difference , the druids. 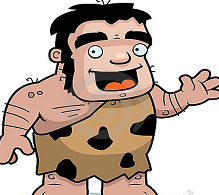 A druid is much more than a normal missionary , it has 2 strenght (can only defend , but has 100% on hills and woods) and heal 1 promotion , also , building druids is the only way to get the druidism buildings , as far as a druid is the only one able to build/discover the nature secrets ( it works like a great prophet ) , and , of course , druids spread druidism. Mesopotamic religion is a global name given to Sumerian , Assyrian and Babilonic mythology. It was a polytheistic religion , with antropomorphics gods representing forces or beeings of the world , like much later greeks will do. In their believes they stablish that gods made human kind to serve them as servants , but , when man became to many , gods have to release them. Ngaiism: has no buildings, as the real religion never did , so them are replaced by the god's blesses , departing from a root one , Ngai bless , the creator god. Ngai was once a human who owned all the cattle in the world. When the sky and earth split he sent all the cattle down from the sky along a long bark rope. The Maasai people received all these cattle. When a jealous group of hunters did not receive any cattle they cut the bark from the sky. This created a gap between the heavens and earth, which stopped the flow of the cattle to the Maasai. This leaves the Maasai with the belief that cattle are a direct link to Ngai and that he intended that all cattle were for the Maasai. SCIENTOLOGY: Scientology is a body of beliefs and related practices created by L. Ron Hubbard in 1952. Scientology teaches that people are immortal spiritual beings who have forgotten their true nature. Scientology promotes spiritual rehabilitation through a type of counseling referred to as "auditing".Study materials and auditing courses are made available to members in return for specified donations. Scientology includes the belief that souls ("thetans") reincarnate and have lived on other planets before living on Earth. Former members say that portions of Hubbard's writings on this remote extraterrestrial past are included in confidential Upper Levels and are not revealed until thousands of dollars have been paid to the Church of Scientology. Tengriism: It is likely that Tengriism was the religion of the Huns, Eurasian Avars, early Hungarians, and of the early Bulgars who brought it to Europe. It is still actively practised in Sakha, Buryatia, Tuva, and Mongolia, in parallel with Tibetan Buddhism and Burkhanism. Egypt Mythology: The ancient Egyptian religion was not really a religion at all in the way that we would think of it, but an overlapping set of cults and rituals that together shared a common worldview. There was no unifying theology or set of canonical writings to the Egyptian religion. Instead, the religion was based upon a series of ritual interactions between the gods and their followers, the Egyptian priests, which had developed over a long period of time. This religion was very old, and dates back to at least 3000BC but possibly even earlier. VooDoo: Voodoo is spelled several ways: vodun, vaudin, voudoun, vodou, and vaudoux. It is an ancient religion practiced by 80 million people worldwide and is growing in numbers. With voodoos countless deities, demonic possessions, animal sacrifices (human sacrifices in the Petro -- black magic form of voodoo); voodoo practitioners cannot understand why their religion is so misunderstood. Voodoo belief recognizes one Supreme Being who created the universe, but who is too far away for a personal relationship with its worshippers. Therefore, the cult followers serve the loa or lesser deities to gain guidance for their lives. The loa are the spirits of ancestors, animals, natural forces, and the spirits of good and evil. Zoroastrianism: ] Zoroastrianism was founded by Zarathushtra (Zoroaster) in Persia which followed an aboriginal polytheistic religion at the time. He preached what may have been the first monotheism with a single supreme god, Ahura Mazda. Zoroastrians belief in the dualism of good and evil as either a cosmic one between Ahura Mazda and an evil spirit of violence and death, Angra Mainyu, or as an ethical dualism within the human consciousness. preserved in pre-literate Greece through oral tradition. The Hellenic religion was polytheistic in nature, with innumerable local nature deities in addition to the major Olympian gods and goddesses. Shamanism: is a range of traditional beliefs and practices concerned with communication with the spirit world. A practitioner of shamanism is known as a shaman. There are many variations of shamanism throughout the world; following are beliefs that are shared by all forms of shamanism. Shinto: is the native religion of Japan and was once its state religion. It is a type of polytheism, and involves the worship of kami, or spirits. Some kami are local and can be regarded as the spiritual being/spirit or genius of a particular place, but others represent major natural objects and processes: for example, Amaterasu, the Sun goddess, or Mount Fuji. Shinto is an animistic belief system. The word Shinto, from the original Chinese Shendao, combines two kanji: "shin", meaning gods or spirits; and "to", meaning a philosophical way or path. As such, Shinto is commonly translated as "The Way of the Gods." The Yorùbá religion comprises religious beliefs and practices of the Yoruba people of old before the Yoruba community encountered Islam, Christianity and other faiths. It originated from Africa (chiefly in Nigeria and Benin Republic), and in the New World, where it has influenced or given birth to several Afro-American religions such as Lucumí in Cuba and Umbanda and Candomblé in Brazil in addition to the transplantation of the homeland religions. Though specific numbers are unknown, it is possibly the largest African-born religion in the world. Please read through this FAQ before posting questions on the Modpack's forum. It is very possible that someone else has already asked your question and the answer is included below. Make sure you are running this under English only, otherwise i cant do much about it. 1.) I have Civ4 Complete and/or Vista and I've installed your modpack but when I play a game I can see the map & my units but not any interface or command buttons. Why is this & how do you fix it? This is a problem that can happen with modpacks that include the BUG Mod and Civ4 Complete installations. Basically, Civ4 Complete places its registry entries in a different location than the normal Civ4 installation & thus causes problems with the BUG Mod. 2.) Is this modpack, and are the included new civs "Modular"? If not, then why not? No, the contents are not modular but I have not turned on modularity in the modpack's ini file and have not included a "Modules" folder so that you can theoretically add other modular files to it. You should be able to do that yourself. I chose to build my modpack this way because BtS modular loading is not really modular and (I think) has some problems with it. For instance, if I had made all my civs modular as CIV Gold has done and you wanted to remove one or more civs you would need to still edit various xml files and not just delete the civ's module folder. As an example, let's say you wanted to remove the Cuba civ. The modular way would involve editing the DiplomacyInfos file (which is not modular) in several places to remove the diplomacy text for Cuba's leaders and then editing the CivilizationInfos file to remove Cuba as a derivative civ of Spain. Both these steps would be necessary in order to prevent errors when starting the mod after removing a civ. The alternative as I have set up my modpack is just to follow the instructions below in question#4, only editing one xml file and not having to delete any files. Another downside to using modular loading is the way new civs and leaders are shown in the Custom Game screen. 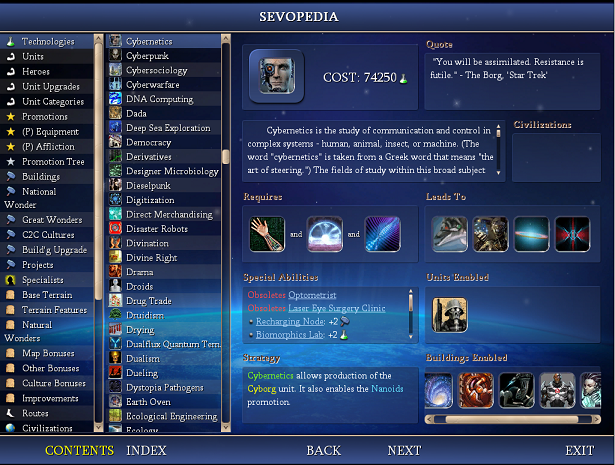 With modular loading all the new content is listed randomly in any drop down menu such as the Civilization selection menu. In my modpack, the new civs and leaders are seamlessly integrated with the original Firaxis content in an organized fashion. On the flip side, I realize that there are benefits to modular loading such as the possibility of easier debugging. 3.) Why did you include the abc civilization and not the xyz civilization? I have only a few extra civs in the mod right now, but again will be adding about 30 more soon. I wanted to include some civs that are fun and different. This is a game, after all. 4.) I don't want the abc civilization in my game. Is there an easy way to remove it? Yes. Simply edit the "CIV4CivilizationInfos.xml" file located in [MODPACK]\Assets\XML\Civilizations\ with Notepad, find the civ in question and change the values for "bPlayable" and "bAIPlayable" from "1" to "0"
5.) Why don't some of the new leaders look more like their real life counterparts? I am not a professional 3D artist (or programmer for that matter) and am limited by my talent (or lack thereof) and the retail 3D models available. Basically, I've done the best I can. I can only take what CFC has available to this forum. 6.) How can I change the name of a Leader or Civ that is displayed in game (ie: "Vittorio" to "Vittorio Emanuele II")? With Notepad, open the "NWA_CIV4GameText_Civs.xml" file located in "[MODPACK]\Assets\XML\Text" folder and search (CTRL-F) for the name, as it is now, that you want to change. For instance, search for "Vittorio" and you should go right to the "TXT_KEY_LEADER" entry. From there, change the 5 entries for English, French, German, Italian, and Spanish to whatever you would like displayed in game and on the menus. 7.) What is the difference between this and CIV Gold? 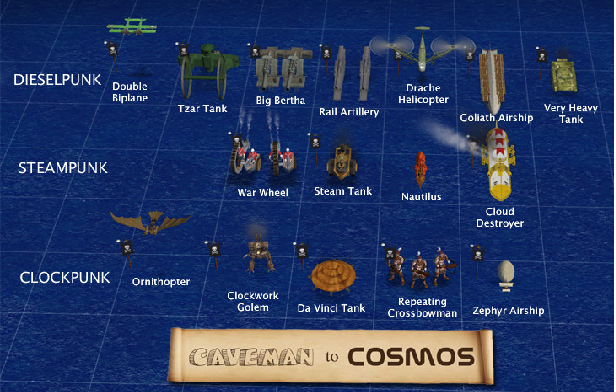 I have included at a minimum of at least 10 units, whereas Civ Gold has one or two for each civ. CIV Gold adds many quality civs (more than double my modpack) but does not currently have any interface, gameplay, or SDK changes included. I have used various civs and LH's from them and vice versa so chances are that many of the civs will be similar. CIV Gold is well worth checking out whenever you get an opportunity. 8.) I am getting an error message or CTD (crash to desktop) when playing. What do I do? 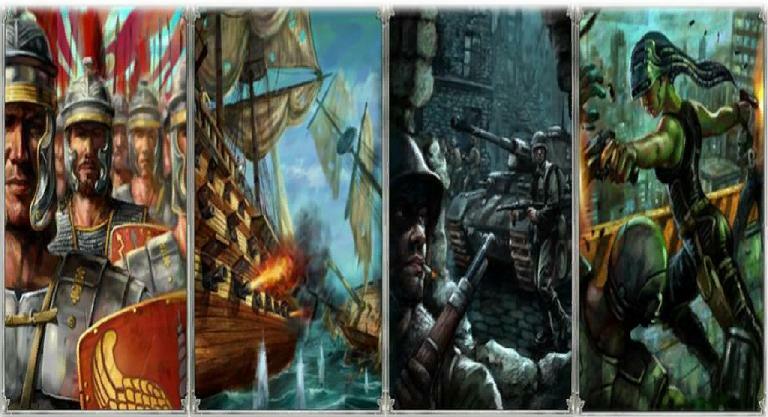 I have tried to test this modpack as best as I can but I am only one person and not a team with a QA Dept so I apologize if this modpack causes any errors in Civ4. Anyway, if possible PM me or post on my forum the last savegame that you have prior to the crash. 9.) Sometimes when I play I will come across two civs next to each other that have border colors very similar to the point where they blend together. Why is that and is there any way to fix it? Not without creating problems with other civs. I have tried my best to ensure that each civ has a different primary color but unfortunately, when you have alot of civs, it is bound to happen. 10.) Some of the new leaders in my game don't look as nice as the preview images, why is that? You most likely have a computer with limited graphics capability that can only display the "nonshader" versions of the new leaders. I have tried to make both the shader and nonshader versions of a leaderhead as similar as possible but invariably the nonshader version is just never as nice as the higher quality shader version, sorry. 11.) I see something that I created (Unit, Building, LH, etc) in your modpack but you didn't give me any credit. Are you a no good, dirty rotten scoundrel, or worse? Now, now, let's try to refrain from any name calling. I have tried to keep very meticulous track of the credits for my modpack, but I am only human and may have missed someone or two. If I missed your name then please let me know and I will include you in the credit list when I post any patch or update. In the meantime, thank you for your hard work. It is appreciated. 12.) Can I use leaderheads, units, buildings, civs or other elements from your modpack in my own mod to be posted online? Of course. Please try to credit the proper person (see question #14) by looking through the Readme file. You will need a utility called PakBuild to extract the art files. This can be found in the utilities section of Civfanatics.com or by googling. 13.) Has this modpack been translated into languages other than English? No. I only speak English and do not have the knowledge or time to complete such a massive undertaking. It should still work on alternate language installations though, as I have included XML entries for other languages. These new entries are just in English. 14.) No Interface problem with Civ4 Complete? If you have Civ4 Complete you need to open the RoM folder and look at: RoM readme, it somewhat explains what to do incase of missing interface. 15.) Some of the Civ4 Alerts are turned off? 16. Q. I cant use my inquisitors.. Bug or how I am supposed to remove religions? I move my inquisitor in a city with 3 religions (want remove to the 2 other) But I cant get any option to remove anything. A. You should have Theocracy civic active and your state religion must be present in the city where you try to remove the other religions. 17. Q. Maybe I missed out on something, but what does your graphic card memory or even system memory have to do with the actual size of the save game? A. The more units, buildings, improvements the saved game file has, the more memory your computer needs to show them all and the bigger the saved game file gets - it's direct relation between those two things. Eventually you might run into situation where too many things are visible in the screen and your graphic card runs out of memory and causes crash. This issue has been in all games that uses Gamebryo engine (for example Morrowind and Oblivion suffered from MAFs as well) due to some memory leak bugs. 18. Q. I normally play the game at 1920x1080 res and use the detailed city info option. If I set this option prior to loading the mod, the setting saves. I can exit the game and restart and my settings save. Once I try to load a saved game using the mod or just load the mod from the main menu, the resolution switches back to 1280x720. I can then change the res back to my preferred settings (although this can occasionally cause a crash). From here, I have no problems playing the game. After I end the game and later come back and play again, when I start up civ4 (no mods yet), my resolution is back to 1280x720. It seems my resolution and other general civ4 settings are being reset whenever I load the mod or play a game using it. If in Vista you need to click on it. Go to properties and then there is an option in there called run as Administrator. Click it and your problems should go away with the interface. Also you need to actually disable UAC (User Access Control) - that applies for basically every patch you install to any game. Also: No Interface is normally caused by a Python syntax error. Turn on all the logging options in your Civilization IV.ini file, then start the game and load a save. Now look in the Logs directory of the My Games\Beyond the Sword folder. You should have a file there called PythonErr.log; open that up and you will see the details of the error. Random crashes and repeatable ones. Not much to do about the random crashes but have your Civ Config set to autosave every turn, and go on from there. Repeatable crashes are the ones that stop the game completely and will NOT auto save from that point on, those are the ones that will be focused on. Make sure you have your Maximum Compatibility savedgame available and your logs, and post them in this forum. If your name does not appear in these credits, pls advise me and i will gladly put them here, because without your input, there would be no Civ4 modding: so THX. Lots of free time to spare, will take way over 100 hours to win. looks great, very similar to rise of mankind 2 though. what are the differences between the two? In the credits, I have put the base is Rom 2.2, but for right now i have included about 100 extra units more than RoM for Flavor units throughout the Standard civs. Its also a lot of Diversica and Varietas Delectat units also, and a little of Civ Gold and Amra also. I thought i got eveyone that was in the graphics section. btw, your stuff is great!! EDIT: Download link is now available. I see... any plan to add revolutiondcm too? I know it's not 100% stable yet, but who knows what might happen in the future? Its also a sum of Diversica and Varietas Delectat combined also, and a little of Civ Gold and Amra also. Maybe you should talk to Kalimakhus, he added the Revolution mod to Zappra's? Never know, he is a nice guy. Good luck with this, looks darn big! 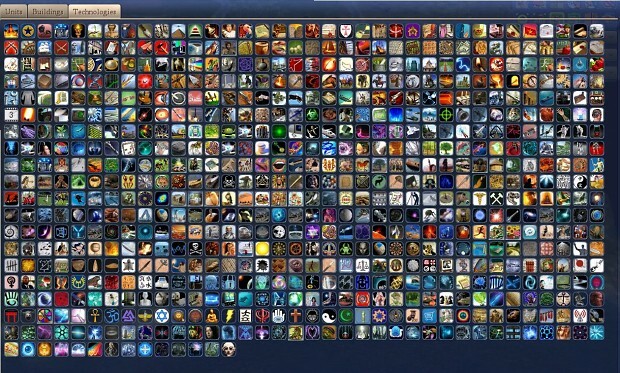 Its big, but i am going to make it huge, i have like 30 more civs to add right now, i want to add 70 more. And thx for the words of encouragement, as i said in a different post, i like your merged mod also. Wish i could do some stuff like that, but only stuff without a dll or SDK changes. I thought I would let you know. In the poker game of life women are the rake- The Worm "Rounders"